A pearly-white smile is beautiful to look at and can greatly improve self-confidence. Many people are opting for the Zoom!® Chairside Whitening System (Zoom!®) for fast, safe and effective teeth whitening. Zoom!®technology with proven chemical formulas. This ensures that the bleaching experience is painless, and the results are satisfying. View a sampling of the amazing results in our SMILE WHITENING GALLERY. 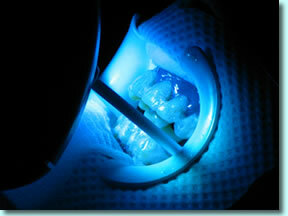 A specially designed LED light is used to activate the gel and expedite the whitening process. This specialized light contains a unique infrared filter that works to reduce the amount of heat (and therefore sensitivity) on the surface of the teeth during the procedure. The internal structure of the teeth remains completely healthy and intact during and after the treatment. Prior to treatment, there will be a consultation where we will outline the exact procedure. On treatment day, a deep cleaning (prophylaxis) will be performed to rid the teeth of any debris and plaque. Then, special eyewear will be provided to protect the eyes from the bright LED light, and splashguards to protect the clothing from the bleaching agent. If you have questions about the Zoom!® Chairside System, please get in touch. *It is important to seek advice from us prior to beginning any bleaching regime. Women who are pregnant or lactating should not seek bleaching treatment.